Paramount Tower Hotel and Residences in Dubai. China State Construction Engineering Corporation (China Construction) has been awarded a Dh554-million ($148 million) contract by Damac to build the Paramount Residences at the Paramount Tower Hotel and Residences in Dubai, UAE. China Construction will be the main contractor for the construction of 27 floors that comprise a collection of luxury residences on Paramount Tower Hotel and Residences, an 867-key luxury tower on Sheikh Zayed Road. The residences are located on levels 37 to 63 of the 64-storey project, which will offer a sky lobby with views across the Burj area, a private Paramount Pictures screening room, a rooftop infinity swimming pool with a terrace and a fitness and wellness centre with a hi-tech spa. The project is scheduled for completion in the first quarter of 2020, said Mohammed Tahaineh, senior vice president (commercial) of Damac, after signing the agreement with Yu Tao, the president and chief executive of China Construction (Middle East). 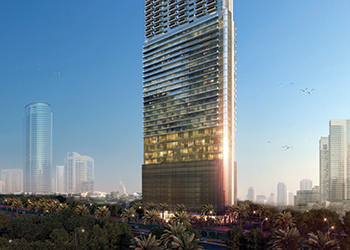 Tahaineh said Paramount Tower Hotel and Residences was one of Damac’s prestigious branded projects in Dubai. “It is one of the four landmark hospitality projects we are developing in collaboration with Paramount Hotels and Resorts, featuring Hollywood-themed hotel rooms, hotel apartments and residential units in Dubai and Riyadh. It gives us great pleasure to appoint China Construction for the provision of contracting services and the delivery of this much-awaited property,” he stated. The residences feature hospitality units with separate living and dining areas, as well as two and three-bedroom arrangements in addition to exclusive penthouses.